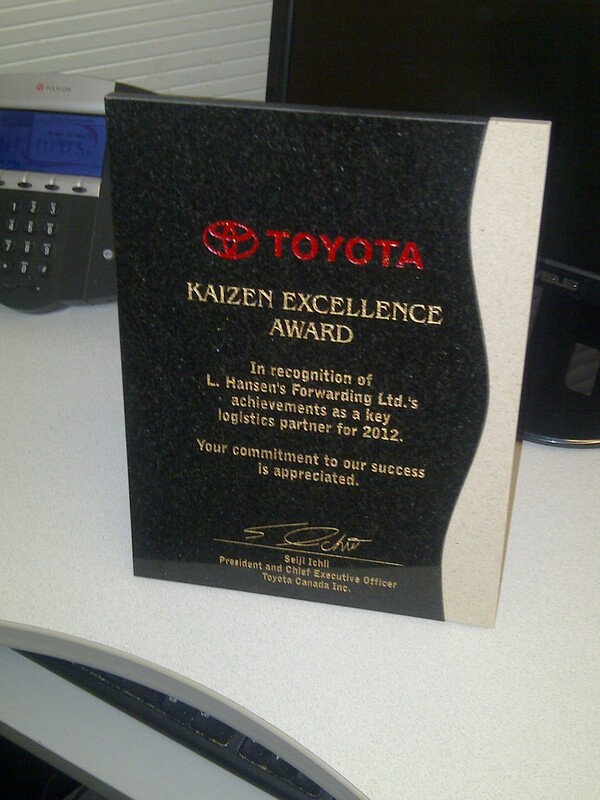 Celebrating Hansen’s Toyota Canada Kaizen Excellence Award 2012! Hansen’s is very proud to share with you our 2012 Kaizen Excellence Award presented by Toyota Canada, earned for our success in the implementation of Wireless Driver Computing & Reporting systems! The Wireless program reflects the very definition of Kaizen – Continuous Improvement – and there is more to come as we improve and enhance! The wireless program has created significant benefits for Hansen’s and all of our customers, Toyota included. The program provides numerous benefits and increased efficiencies in a number of areas including faster SLA reporting, the reduction of paper waste which lessens our negative impact on the environment, and the increased efficiency in the handling & processing of remaining paper loads in the office.